Dushanbe (AP) — According to the general urban planning of the city of Dushanbe, the first line of an aerial metro will operate before 2040. “The first line of the Dushanbe metro will be aerial and will connect the southern gate of the city (to the Khatlon region) to the city’s circus district”, an official of the Mayor of Dushanbe told AP. To date, the city authorities are studying the possibility of building underground sections of the future Dushanbe metro. “Experts are exploring the problems and obstacles that can arise when building underground branches of the city’s metro”, noted the metropolitan administration. The corridors of the Auezov Theatre station. The expected lines of the future metro are also under study. Some residents of the city have already proposed the construction of a metro line from the airport to Korvona and from the circus to the micro-district of Zarafshon. 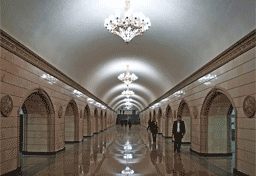 The Dushanbe Metro will be the third one in Central Asia. Today, the metro operates in Uzbekistan’s capital, Tashkent and Almaty. There are plans to build a metro in Bishkek.